OVER THE PAST YEAR, I've attended amazing food events and informative cooking classes, ate at some great new restaurants, met inspiring local chefs and foodies, enjoyed lots of fabulous food and watched a few terrific films. And so has my friend Eva Cherneff of The Monday Through Friday Gourmet. So we’ve put our heads together, compared notes and have created a Vancouver Island, best of guide for 2009. We hope you agree with our picks- and would love to hear what your favorite food memory is from the past year. 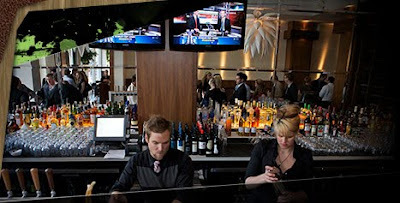 Here in Victoria, we are fortunate to have food and wine events year-round to draw new knowledge and inspiration from. And what is our pick for the best event of 2009? Island Chefs' Survival, Madrona Farm’s second annual fundraising event is our choice because it was such good entertainment, has a fabulous roasted chicken lunch, and was for a worthwhile cause. Local chefs donned full survival gear and battled it out forging, cooking and auctioning off gourmet meals that they prepared in an open field. Hope to see you all there next year. In February 2009, the newly elected U.S. President Barack Obama visited Ottawa to enjoy a quintessentially Canadian luncheon as part of his first international visit. Let’s all raise a glass and give a toast to B.C.’s own Quails’ Gate Winery and its Chenin Blanc 2007 for being one of three wines served during the luncheon. No list would be complete without mentioning Julie & Julia. This delightful and heartwarming, charming and funny movie won the hearts of serious eaters everywhere, and this is before it even came to theatres. 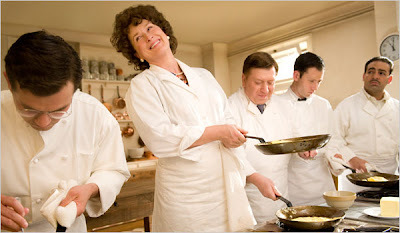 If you loved the movie as much as we did then you should read My Life In France by Julia Child. Bon appetite! This past year, Chalet Estate Winery shook it up in a big way with a new name, label and award-winning flavor. The change from Chalet to Muse Winery was a big hit who were awarded two bronze medals at The Wine Access - Canadian Wine Awards for their 2006 Merlot and 2008 Viognier. Blog readers recently had the chance to vote for Victoria’s best new restaurant – and the clear winner is Victoria’s newest tapa lounge, Veneto in the Rialto. Veneto opened this summer in the beautifully restored Hotel Rialto and offers a refreshing, new addition to the city’s restaurant scene. Thanks to everyone who voted. A victorious first, this past year marked the time that Monday Magazine featured local food blogs in their annual City Guide ‘09. As Monday points out, given that Victoria is such a foodie destination, its no surprise we’ve got a second helping of food blogs. We’re looking forward to seeing more of the same this year. A highlight at Vancouver Island’s 2009 Feast of Fields was Fairburn Farm’s Nodding Onion and Local Red Fife wheat blinis with Natural Pastures bocconcini. I for one couldn’t get enough of these. Check out Mara Jernigan’s upcoming cooking classes and boot camps – you may just learn how to make these delightful little treats. A big thank you to all the cooking schools in Victoria who held amazing cooking classes and brought some celebrity chefs to the island this year. One memorable guest from this past year was Chef Anthony Sedlak. We had the pleasure of Anthony coming to the island and teaching a set of outstanding classes. Anthony is humble, talented Chef, a great entertainer, and we’re looking forward to seeing him again this year! Slow Food is a non-profit, eco-gastronomic member-supported organization that was founded in 1989 to counteract fast food and fast life. Slow Food believes food should be good, clean and fair. It should taste good, be produced in a clean way that does not harm the environment, animal welfare or our health, and that food producers should receive fair compensation for their work. Vancouver Island and the Gulf Islands are lucky to have an active chapter that hosted a ton of inspiring and informative events this past year. Check out their website, sign up for the monthly newsletter, and we hope to see you at an event this year! A relatively new catch for Vancouver Island, we are delighted that Dan now calls Victoria home. Born in London, Dan has worked for a number of celebrated seafood restaurants in Britain including Rick Stein’s restaurants, the Poissonnerie de l’Avenue and Fishworks in London. Dan shares his passion for fish cookery and classical cuisine through his cooking classes in Victoria and abroad. We are looking forward to seeing more of Dan and taking a class of two with him at French Mint, Thrifty Foods Tuscany Village or Recreation Oak Bay.